Mawa Puff, Mawa Samosa and Mawa Singoli are some of the other products which are highly appreciated for their delicious taste. Committed in providing the best quality and mouth watering mawa puff, mawa samosa and mawa singoli to our esteemed clients, these sweets are prepared with pure ingredients and the best quality desi ghee. Mawa and other ingredients are used in making these delicious and mouth watering sweets. 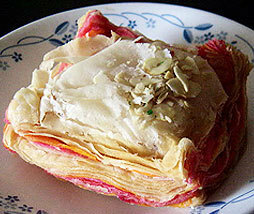 Description :Made of mawa, sugar and flour.